"I have a nice, shiny Buffalo nickel. What is it worth?" My reply: "What is the date?" His answer: "The date is worn off, but the rest is nice and shiny." During its years of production from 1913 to 1938, the design of an Indian chief on the obverse ("heads" side) and a bison on the reverse ("tails" side) symbolized two American icons on one coin. The novel design by James E. Fraser replaced the more traditional Liberty head series, also known as the "V" nickel. From the start, there were some varieties and some rather scarce issues. The Variety 1 issue shows the bison (or buffalo) standing on a rocky mound. Early in 1913 this raised feature caused the denomination "FIVE CENTS" to wear more rapidly than if it were recessed. Variety 2 came out later in the year with the "FIVE CENTS" in a recessed area under a line topping off the mound. From a collector's point of view, the Variety 2 was the scarcer for all three mints  Philadelphia (no mint mark), Denver ("D") and San Francisco ("S"). Today the "S" Variety 2 catalogs at $140 in Good condition and $300 in Extra Fine. Many of the early Denver and San Francisco-mint coins also command a strong premium, varying from $15 for the 1914-S to $35 for the 1921-S. In those early years, two very significant varieties were struck. The first one, which was not discovered until some 30 years after the fact, was the 1916 doubled die  where the date appears twice (especially the 6). A low-grade specimen catalogs at $1,600, and in Extra Fine the value rises to $11,500. It is unknown how many were made, but fewer than 100 specimens are known today. The second variety is the 1918-D struck over a 1917-D nickel. The 8 over 7 is clearly visible on all but the most worn specimens. In low grades, the coin catalogs from $600 in Good to $1,000 in Very Good (which is still a relatively low state of preservation). Up until the early 1930s, it was obvious that the date on most circulating Buffalo nickels wore off  at least the last two digits, then all four. In fact, as a young collector of the series in the 1940s and 1950s, most Buffalo nickels showed no date at all. The coins with dates usually were 1934 to 1938. In the later years, two more interesting varieties were discovered. The first was the "three-legged" variety 1937-D. It was the result of over-polishing the die until the right foreleg was polished off. This popular variety sells for $175 in Good condition to well over $500 in Extra Fine. 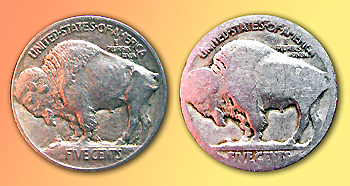 Around 1965, someone discovered that some of the 1938-D Buffalo nickels showed a "D" mint mark over an "S" mint mark. How this occurred is strange, since no 1938-S Buffalo nickels were made. This popular over-mint mark (or "OMM") catalogs for $10 in Fine condition and $75 in average Mint State condition. It is not rare, and there is more than one variation of this OMM. There is also a 1938-D/D mint mark known as an "RPM" or repunched mint mark. Again, it not rare and is worth a few dollars over regular 1938-D coins of the same grade. With the current Jefferson nickels honoring the Lewis and Clark expedition of 1804-05, the bison once again appears on the reverse of our nickel. The new bison is smaller than the earlier version. It may inspire collectors to start, or finish, a set of Buffalo nickels  which in today's market is quite feasible. Without the two major varieties, a complete set in average circulated condition can be assembled for under $1,000. Of course, the better the grades, the higher the cost. An uncirculated set would run in the tens of thousands  well up to six figures for nicer sets. As with other coins of the era, the first few years included special collector coins called "matte proofs" (1913-1916), sold by subscription and over the counter at the Philadelphia Mint. These are very low-mintage issues  600 of the 1916 and 1,500-plus for the 1913 Variety 1. Their catalogue values today range from $700 to $1,500. There were also brilliant proofs issued in 1936 and 1937. Although the mintages are higher (4,400 in 1936 and 5,700 in 1937), the catalog values are $1,000 and $800  and recent auction prices are considerably higher. These two proof coins bring out the features Fraser wanted for his design in glowing sharp detail. The over-the-counter price for the two coins at the Philadelphia Mint was 20 cents each. I was offered some of the 1937 proofs in 1940 when my Dad and I visited the Mint. He said 20 cents each was "too much."